Not all the QE is a bad plan, cause they have generated full employment in U.S. at least (4% unemployment). And the hourly cost of employess are increasing month per month. To be very basic, more employees that earn a little bit more each month/year, means more money in "play" on the system (but is the money allocated into profitable businesses?). Then, houses as expected had increased a lot and the PCE deflator reaches the 2%. If the interest can only stay as today or go higher. All business with credits (most of them) will have their interest payments increased too. And the business that do not generate a big ROI will die. The example given at the beginning, a business with a ROI of 2% will not be able to survive. Why get 2% ROI if you need to pay 3% on interests. This been said, I suppose hard times in terms of unemploymenta are coming to U.S. (although Trump is trying to impose tariffs to repatriate all the work is done out of U.S. and allocate all this people that will lost their jobs into those jobs repatriated). So, Unemployment can be increased in U.S. in my opinion. I`m not saying will go so bad as 2007 but could risea little bit. Meanwhile the inflation stays contanst or increases due to the big easy money. And here we have the stagflation afterwards. 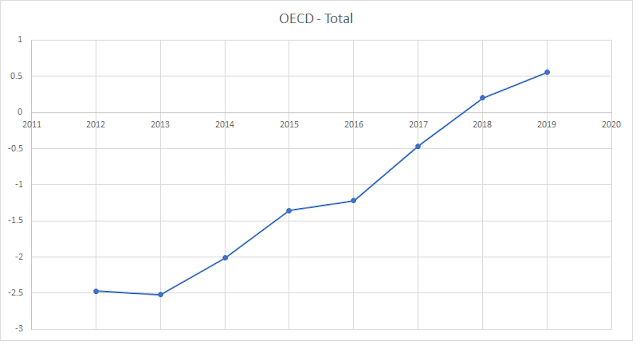 After doing some research at oecd.stat public webpage. 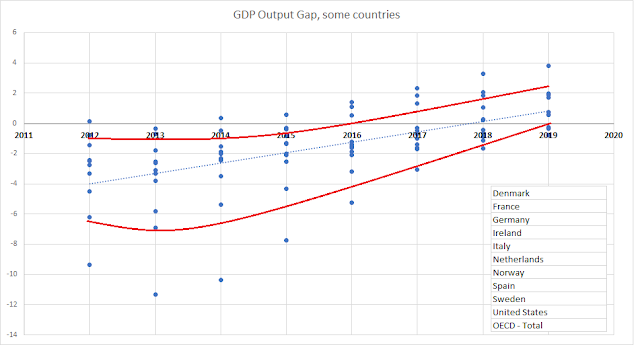 I figure it out that there is a difference between both countries in how the GDP is divided. 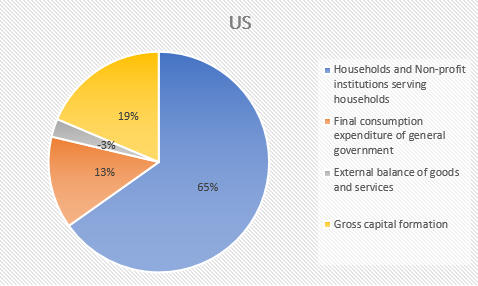 If we look at the "Gross domestic product (expenditure approach)" for both. 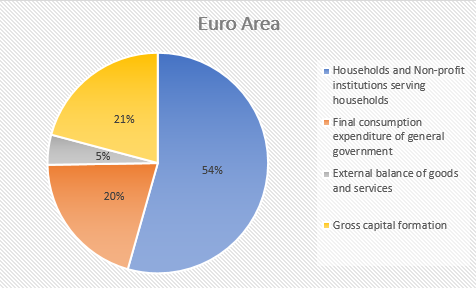 It`s interesting to check that meanhwile euro area household consumption represents 54% of the GDP , for US, this is almost a 70%. Huge difference in my opinion. 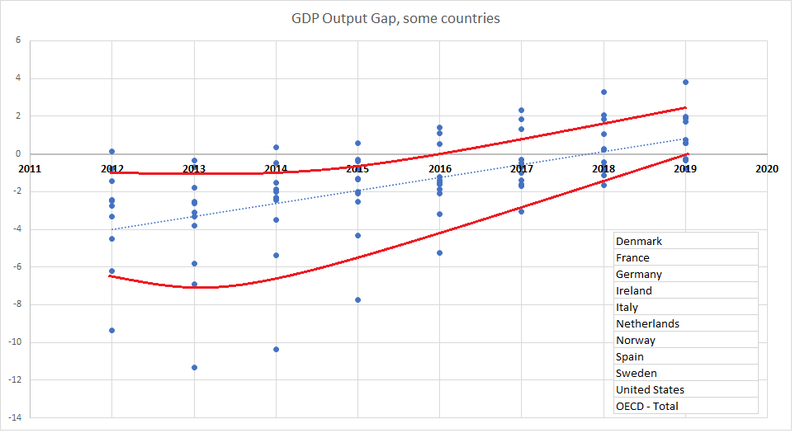 If before 2015 almost all countries (from the countries listes in our analysis, in the image below) were in a negative GDP gap between the potential GDP and actual GDP. Actually some of them are already in positive GDP gap and the rest are almost at full GDP capacity. 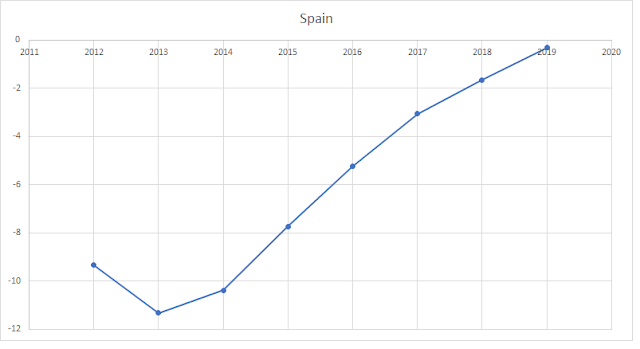 The estimation for next year (2019) is that almost all of them will reach and overpassed the potential GDP. This is what concerns more. ¿Is it possible to maintain years on this pace before any recession pops up? I was thinking US was even higher that OECD, but seems they are "running" at similar pace. The stock market at leats jumps much more in US that in Europe. That`s weird. 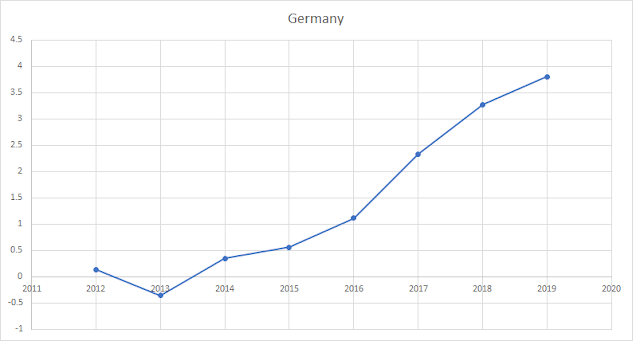 Germany figures are very surprising. 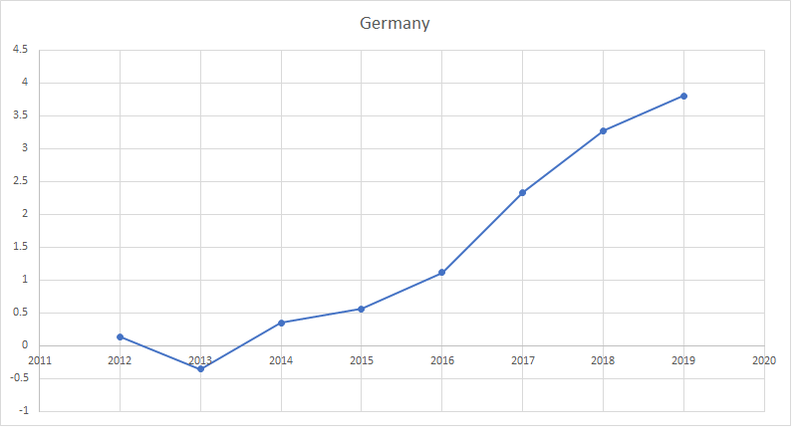 Germany remains since 2014 over the potential GDP and no recession yet started. I will move the language of this blog to english from spanish. So from now on, all my post will be posted in English, sorry for the inconvenience. Let`s start with what most concern us. After the february 2018 sell-off and volatility rise, the stock market comes back to reality: It is risky to "dance" in it. There were plenty of years where there were no risk at all playing in the stock market casino. Everybody was capable of gaining money, just betting that the market will spike. Those year have come to an end and with it the doubts if this means that the "music" has stop at all. Since the lowest of the SP500, it has increased an aproximatelly 400%. 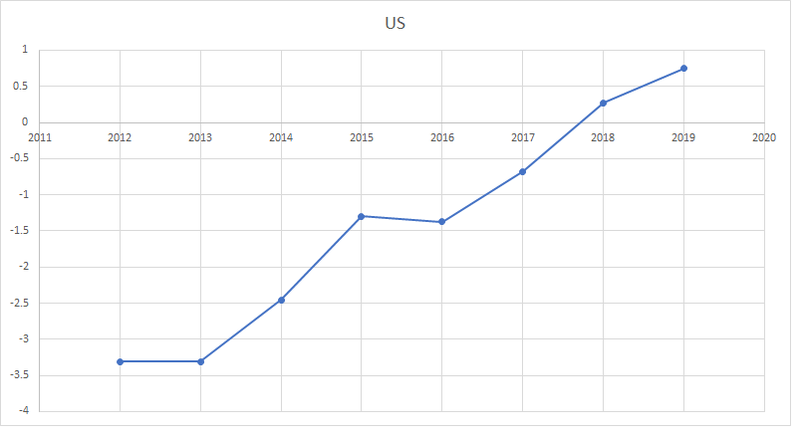 US tappering has ended years ago, and now the concerns are on the inflation. After pumping so much money in the system, who knows what can happen, maybe in a quarter the inflation can rise and the interest will need to increased a more lot than expected. This was the reason of the february 2018 sell off, due to a very good increase or employee hourly earnings that can bring on inflation into the system. Apart from that, bonds were forced to stay in a superlow interest, due to the countries that were buying like a crazy, bonds of all kind. Having such big buyer, the countries did not need to pay much interest for the debt, however, who knows what can happen when the BIG buyer stops buying it (US stops buying bonds end of 2014). Less buyers in bonds, means that the countries will need to pay more to sell same quantity of bonds. Apart from that, in order to fulfill the tax cut in US, the government most probably will need to ask for more funds (so more bond selling). More bond selling and less buyer means, increasing the interest of 10Y Note or 30Y Note. Increasing the 10Y and 30Y Note, will affect directly to consumer on their mortgages, and in order to pay for the higger monthly payments , consumer will need to reduce consumer spending. Until nowadays, the earning company figures were increasing quarter to quarter. But this bond increase hits doble side to companies, cause the companies will need to pay more for their debt (as the interest rates spikes) and the consumer spending will be reduced. 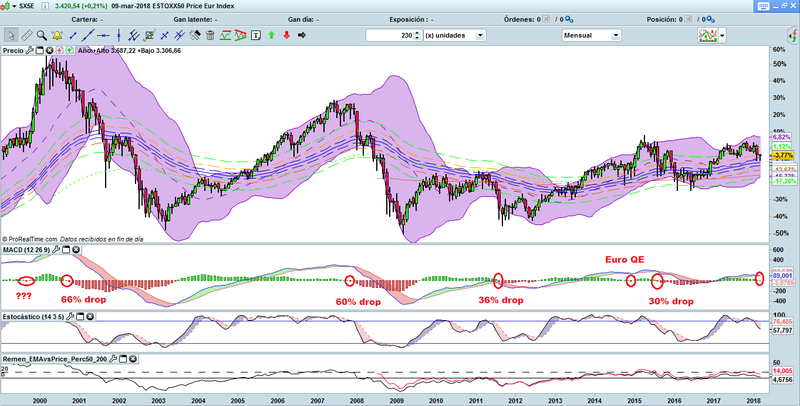 Before analizing the SP500 graphs or stoxx50. I would like to check the bond interest rate historical chart. Since june 2017, the interest of 10Y note bond has spike from 1,4% to 2,8%. If it crosses the 3%, it will pass the 2013 figures. Apart from that, a 3% interest on super save products (US bonds) might move the money from stock market to bonds, creating big sell in stock market and buying a lot of bonds (which will push donw the interest rate). More or less in both (stock market and bond market) the capitalization aprox. to 100 trillion $. 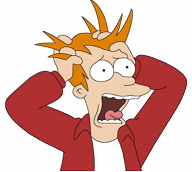 Meanwhile the bond interest rates hikes, all system shakes. Then next time it crosses from positive to negative, was november 2007 before the big crash of 60%. Then we have another red histogram on august 2011, in this case it was too late the monthly chart. 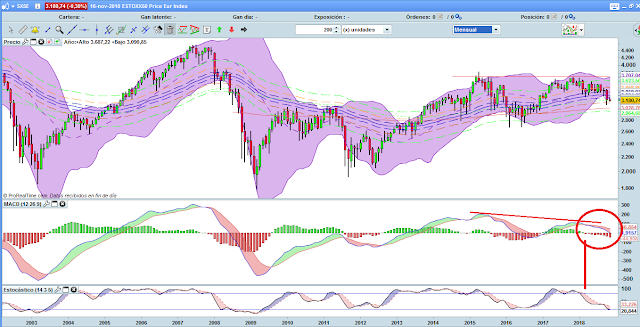 That august the stoxx50 has already drop 13%. The market was prepared for another sell of on december 2015, but the next month, the QE in europe was published and stock market rump up, till july 2015. We had another 30% drop. And here we are again, the histogram was sliding down, and this february 2018 went red. So here we have our doubts. What will happen?. If I look to history, seems to be a very reliable indicator, that the market can go down. Apart from that, there will be no QE in a short period of time, most probably interest rates will go higher in US (and europe will start tappering). The tensions on US tariffs for steel and alumium can speed up the crash too. So if we mix all in one cage, I would say the recession, at least on stock market is close by. Maybe not next month, but very soon.